Hugh Jackman | No Chic. Just Geek. ‘Why are you going to see The Greatest Showman? You’re going to hate it,’ said Next Desk Colleague, looking genuinely baffled. Well, a number of reasons, to be perfectly honest – things are quiet at work at the moment, giving me plenty of afternoons to spend catching up on the current crop of movies, and there’s also the fact that a friend whose judgement I respect had already informed me that it was (not to put too fine a point on it) ‘atrocious’, and if there’s one thing I can’t resist, it’s the promise of a genuinely duff film. And, as frequent visitors will recall, lurking at the back of my mind was the spectral figure of the mysterious individual who went to see The Greatest Showman eight times at the same local cinema in the first few days of its release. I’ve only ever seen The Empire Strikes Back four times at the cinema, for heaven’s sake, and if memory serves the all-time record is held by The Two Towers, on six – and that was over the course of twelve months. So I couldn’t help but be a bit curious about Michael Gracey’s movie. Depending on how you look at it, this is a feel-good family-friendly musical extravaganza, a carefully-positioned tilt at the awards season from 20th Century Fox, or the first step in Hugh Jackman’s post-Wolverine movie career. Or it might just be a biopic of the famous American entrepreneur and impressario Phineas T Barnum, albeit one with an especially shaky grip on historicity. Well, anyway: Phineas Barnum (Jackman, mostly) grows up in abject poverty as a pauper on the streets of New York, but makes enough of a fortune (the film is vague about exactly how) to be able to marry his much-better-off childhood sweetheart (Michelle Williams), even though they and their inevitable children end up living in fairly limited circumstances. Barnum eventually cons a bank into lending him the money to buy a museum, which is far from a runaway success (the film is characteristically cheery about the fact its protagonist is what is technically known as a massive fraudster). Barnum refuses to let this get him down, and – acting on advice from his daughters – decides to convert the museum into first a freak show and then a circus, personally headhunting his troupe of midgets, bearded ladies, conjoined twins, morbidly obese gentlemen, and giants. Naturally, this turns Barnum into a roaring success, and allows him to take on a junior partner (Zac Efron). Soon he is rubbing shoulders with the well-off and well-bred, and taking the Swedish opera star Jenny Lind (Rebecca Ferguson, not doing her own singing) on a tour of the States. But is Barnum’s desire to better himself socially in danger of making him forget the really important things in his life? Counterpointing this, in the sense that it basically hits pretty much an identical set of notes but with different actors, is a subplot about Efron’s character having a bit of a romance with the circus’ trapeze artist (Zendaya Coleman, in a Mollie Sugden wig). He comes from wealth and privilege, and she is African American, which is obviously a problematic combination given the period in which the film is set. Can true love win through? Well, it may be that some people will be surprised by the manner in which the story of The Greatest Showman eventually resolves itself, but I cannot imagine who they are: members of remote tribes of Papua New Guinea on their first visit to civilisation, perhaps. Then again, it’s not actually a crime for a film to be a touch predictable, and it’s not as if this is the film’s biggest problem. It may be that you don’t live near a cinema or are otherwise unable to sample what The Greatest Showman has on offer. In this case I offer the following guide to having a broadly similar experience: carve yourself a heroic chunk of the ripest cheese you can lay your hands on, sprinkle it more than liberally with sugar, and then feast away to your heart’s content. The Greatest Showman has no truck with things like subtlety or nuance, it just ploughs through the story with a big happy grin on its face. 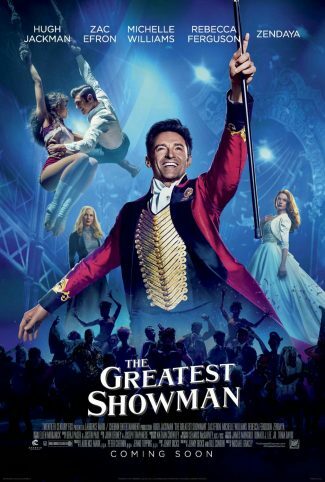 Barnum’s early life is dealt with so summarily that he starts singing the first big number of the film as a pre-adolescent boy and finishes it as Hugh Jackman, who is rather older (sadly, the song is not a rewrite of one from The Sound of Music entitled ‘I Am Thirteen Going On Fifty’). The film clearly wants to give the audience a joyous, life-affirming experience so much it hurts, but it makes the fairly elementary mistake of assuming that in order to do so the mood has to be relentlessly up all the time. If you look at the truly great musicals, they all contain a strong element of real pain and darkness, and some quite heavy subject matter. The Greatest Showman makes a vague gesture in this direction but it never really feels as though its heart is in it, to be perfectly honest. The film’s big theme, to the extent that it actually has one, is the currently-ubiquitous one of inclusion and diversity. Fair enough: it is, as I say, inescapable at the moment. It is, however, surely a slightly odd choice to try and couple this to a story about a man running a freak show, even leaving aside the fact that this diversity-friendly, inclusive movie is one where the two lead characters are a couple of heterosexual white dudes. The mauling that historical fact takes in the process of being adjusted to suit the film’s agenda might be sufficiently brutal to make some viewers call the emergency services. But now we come to the volta, because I haven’t really touched on The Greatest Showman‘s songs and other musical routines yet. The songs are courtesy of Pasek and Paul, who also did the ones in La La Land, and on paper they seem like a fairly anodyne collection, all with messages about being yourself, following your dreams, choosing your own destiny, and so on. Some of the choreography is a long way sub-Bob Fosse, too. However, I’m beginning to suspect that Hugh Jackman’s own mutant superpower is the ability to sell musical theatre to an audience, because the very least you can say about the songs is that they are pleasant to actually listen to. It’s not quite Hamilton, but this is still contemporary stuff: this only occasionally becomes intrusive and silly, as in the moment when renowned opera singer Jenny Lind commences a concert with a 21st century power ballad. However, many of the musical numbers are good enough to lift the spirit in the same way as the best moments of classic musicals of the past. I was humming the first big number, ‘A Million Dreams’, all the way home on the bus, for instance. The staging also helps – Jackman and Efron swagger through a duet entitled ‘The Other Side’, and a very decent song is lifted by some brilliant choreography. The songs are really the main reason to even consider watching this movie. Whether or not the songs are enough to lift The Greatest Showman from the realm of well-meaning cheesiness and give it some credibility is, I suspect, a question everyone will have to answer for themselves. I don’t think this comes anywhere close to the great musicals of the past, but for me the musical numbers were good enough to make the weakness and cheesiness of the rest of the movie excusable. Your mileage may differ, of course, and even I would say that The Greatest Showman is probably more enjoyable as a soundtrack album than an actual movie. It’s a little hard to believe that sixteen years have gone by since the first X-Men film made its debut: that’s a fair chunk of time by anyone’s standards, I suspect, and it’s not as if the owners of the property haven’t been busy – six main-sequence films of somewhat variable tone and quality, two spin-offs focusing on the series’ breakout star, Wolverine, inimitably portrayed by Hugh Jackman, and the rather idiosyncratic (and very successful) Deadpool, a kind of comedic deconstruction of the series. But, it seems, even multi-billion dollar franchises must come to an end (or at least a pause prior to a reboot), and so it is with the X-Men. 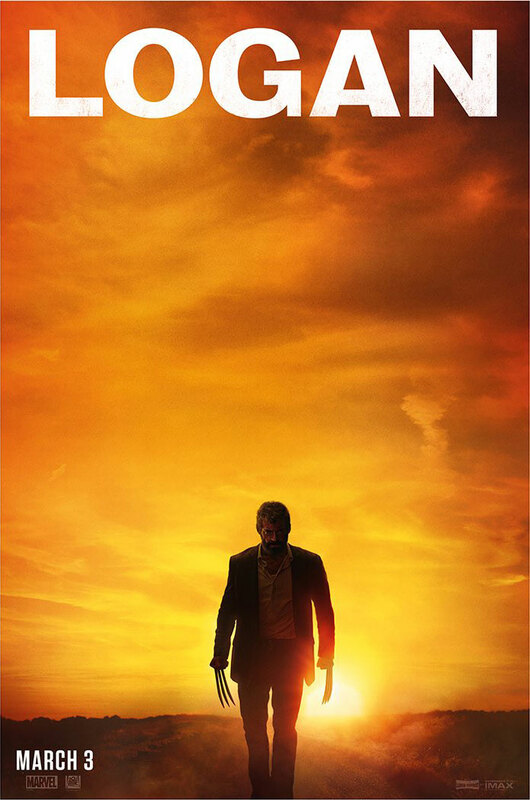 Which brings us to Logan, directed by James Mangold, which could be seen as bringing down the curtain on the current series of films with a distinct sense of finality. The film is set in a dystopian America in the late 2020s, where Logan is eking out a rather grim existence, his two hundred years finally catching up with him and his powers (literally) failing. The subspecies homo superior has almost vanished from the Earth – there are, to coin a phrase, no more mutants – the X-Men have gone, and Logan is trying to care for his old mentor Xavier (Patrick Stewart), who is frail and partly senile (and, as you can imagine, when the world’s most powerful telepath is suffering from dementia, it opens up a whole new can of worms). Logan’s objective is to keep a low profile, disappear. It’s relatively easy to make a good trailer for any movie, but I think it’s safe to say that expectations for Logan were raised soaringly high by the first trailer for the movie – also known as the one with the Johnny Cash song. The mournful, elegiac tone of the trailer promised a very different, much more introspective kind of superhero movie, and the obvious question is whether Logan lives up to that promise. Well, there is a Johnny Cash song on the soundtrack, but it’s a different one, and while this is a much more textured and thoughtful movie than the other ones in the series, the thing that immediately makes it distinctive is that it’s a 15-rated movie (R-rated in other countries), presumably because the success of Deadpool (also a 15) has made the producers relax a bit about the prospect of this kind of film. I mentioned this to my sister, with whom I’ve been watching these movies since they started, and she turned rather pale at the prospect – she was quite right, as the fight sequences that punctuate this movie are stuffed with all the graphic stabbings, dismemberments, and beheadings you would expect from an action film about several characters equipped with various razor-sharp claws. This is a ferociously violent film and I’m a little surprised it managed to scrape a 15, to be honest (there are a fair few F-bombings as well). On the whole, however, the story rambles about (this feels like a very long film) without ever quite making the mythic and emotional connections you might hope for. Mangold is clearly interested in the film as a piece of classic Americana – there’s a road-trip through the wide-open spaces, for instance – but his attempts to make it resonate with classic Western themes mostly just result in odd scenes where the characters take a break from the story to sit around and watch clips from Shane. The movie itself is too invested in its own violence for Logan’s self-condemnation as an irredeemably bad man to have any dramatic weight. Is Logan the movie its initial publicity suggested it might be? Well, no, of course not, but then it’s a rare movie which is as good as its own publicity suggests. Nevertheless, this should not distract from the fact that this is an interestingly bleak and down-to-earth superhero action film, with the usual charismatic performance (or should that be performances…?) 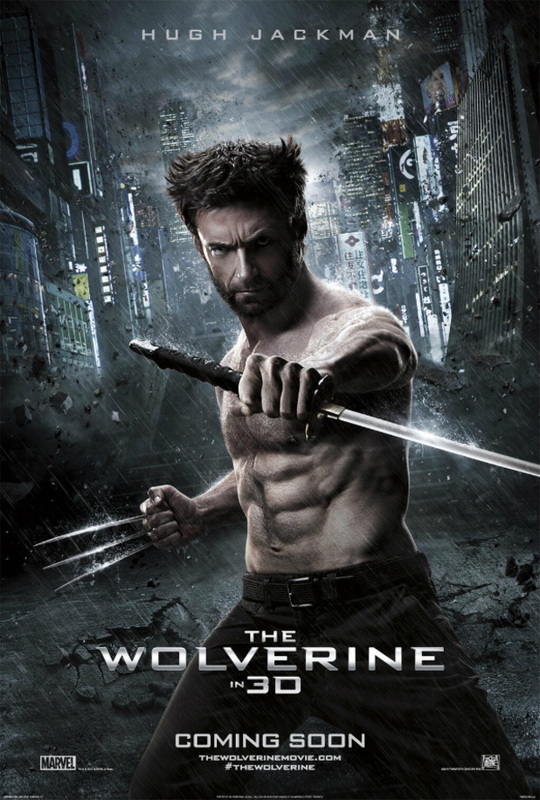 from Hugh Jackman, a decently-crafted plot, and some well put-together action scenes. If this is the final film in the current X-Men franchise, then it’s one of the better ones, although there are also glimmers here of a much more interesting film that never quite makes an appearance. As it is, this is certainly a film for adults, but that’s solely because of gory content rather than its theme. Just when I thought we’d broken free from the clinging embrace of fact-based film after fact-based film, and were now contending with dozens of slightly dubious remakes and sequels, along comes yet another: Eddie the Eagle, directed by Dexter Fletcher (I remember him as a child actor in the likes of Bugsy Malone, The Long Good Friday and The Elephant Man, and look at him now). I also remember the story of Eddie the Eagle when it was actually news, although at the time (February 1988) I suspect I was slightly more interested in the first episode of Red Dwarf, which was broadcast around then. The story is… well, Michael ‘Eddie’ Edwards went to the Calgary Olympics as the sole British ski-jumper, came a resounding last in both the 70m and 90m jump events, and yet somehow became a media celebrity and one of the biggest stories of the Games. This was the same Games that saw the even-more-unlikely appearance of a Jamaican bobsleigh team (Fletcher’s film alludes to this), who were the subject of a movie over 20 years ago, so once again you could argue that Eddie the Eagle has come a spectacular last. The font of the movie’s title sequence is almost identical to that favoured by any number of cosy 70s British sitcoms, while the soundtrack comes as close as possible to copying that of Chariots of Fire without causing Vangelis to actually reach for his lawyer, and these two choices define the scope of the film’s ambition rather well. The credits inform us this is ‘based on the life of Eddie Edwards’, but I would argue this is pushing it a bit. Pushing it quite a lot, actually. Eddie Edwards (Taron Egerton, who to me sounds like a character from a badly-typed Terry Nation script, but I digress) grows up as an Olympics-obsessed lad somewhere in the UK (his parents have vaguely London-ish accents). Eventually becoming a fairly decent downhill skier, he is nevertheless not selected for the British Winter Olympic team, primarily (the film suggests) because he is not posh or handsome enough. Never one to be easily deterred, Eddie yomps off to Germany to become the first British Olympic ski-jumper since the 1920s, although progress is limited and various arrogant Nordic types are unspeakably beastly to him about his efforts. He does, however, end up befriending the local groundskeeper, Bronson Peary (Hugh Jackman), whom he learns is actually a former champion ski-jumper who left the sport in disgrace some years earlier. Could it possibly be that together they will form a bond, that Eddie will rise to become a genuinely competent ski-jumper, and that he will go on to realise his dream of representing his country at the Olympics? Well, like I say, based on a true story, although Edwards was actually born in Gloucestershire, failed to qualify for the downhill event in the 1984 Games based on his times not his background, learned to ski-jump in the US, not Germany, qualified after representing Britain in the 1987 World Championships… I could go on. You can almost hear the film creaking and grumbling as it is forced to include something factually true (Edwards’ successful career as a downhill skier), as it really cuts against its presentation of him as a loveable, well-meaning clown. On the other hand, it makes up for this sole concession to reality by including Hugh Jackman’s character, who is as fictional as Puff the Magic Dragon, and it’s almost impossible not to conclude that both the character and Wolverine himself are both here in the hope it will help the film-makers get the film international distribution. Peary’s background and personality (I repeat: he is wholly made-up) comprise a significant chunk of the film’s storyline (a bemused-looking Christopher Walken plays his estranged mentor), which is kind of the final nail in the coffin of the idea that this film is in any way about the ‘real’ Eddie Edwards. I mean, Egerton gives a committed and vanity-free performance, although it does seem to largely consist of his peering through coke-bottle glasses and sticking his chin out in a vaguely mournful fashion, but in terms of sheer presence and charisma he is effortlessly blown off the screen by Jackman, who spends most of the film in first gear. Say what you like about Jackman’s range as a performer (and I have in the past), but he is always very, very watchable, to the point where you want to see more of him and less of the putative star: the result is that Eddie Edwards seems rather like a supporting character in his own film. And if you’re going to cast loose from the anchor of fact quite so enthusiastically as this film does, you’d better be doing it for a good reason – making it an all-out comedy, for instance. 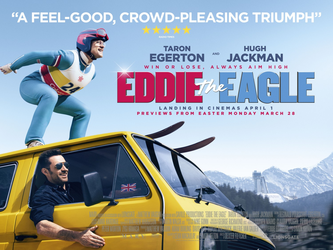 But the thing is that Eddie the Eagle is just not that funny, unless you find endless scenes of Egerton stuffing up his landings and cartwheeling down the slope to be comedy gold. It’s all just a bit too contrived, too broad, too obvious to work. Also, this film is a product of Matthew Vaughn’s company Marv. Last year Vaughn directed Kingsman, in which Taron Egerton played a working-class lad struggling to become a top spy, battling constantly against establishment prejudice, and the reverse snobbery of the film was astounding. Well, in this film, Taron Egerton plays a working-class lad struggling to become a top ski-jumper, battling constantly against establishment prejudice, and it’s exactly the same. It’s just too calculated and cartoonish to feel at all authentic – it’s simply manipulative. Then again, this is a sports movie, and they’re all a bit the same, aren’t they? This one is mainly distinguished by the protagonist’s central challenge being not to triumph, but to simply not wind up killing himself – in the end, though, the structure of the movie is strong enough for it to function as a basic narrative. But that’s pretty much all it does. It barely qualifies as an actual bio-pic, so many liberties have been taken with the facts, but none of those changes actually help it work better as a comedy, or as a drama. In the end this film’s ambitions appear to be limited to just being a vaguely funny, allegedly heart-warming piece of quite simplistic entertainment, hanging off the hook of someone who retains a significant level of name-recognition some 28 years after his moment of glory. I would love to know what Eddie Edwards really thinks of the film with his name on it, but I suspect an NDA has been deployed. I only ended up watching this film through the wonders of my magic free-ticket card, which meant I basically didn’t feel like I was paying to watch it. In those circumstances, it seemed like an inoffensive, fairly competent film on its own terms. But I’m glad I didn’t spend money to see it. We have had a few weeks the like of which are such as to make one want to declare a moratorium on death itself. The emperor of maladies has taken a heavy toll, and we are all left saddened and diminished and perhaps a little more conscious of the dark. One feels obliged to make some gesture of remembrance, but one is horribly spoilt for choice at the moment. I could revisit Galaxy Quest or Toxic Avenger IV with equal justification. But instead I am going to take another look at Christopher Nolan’s 2006 movie The Prestige, which is notable for what turned out to be one of the final acting roles for David Bowie. I would be lying if I said I was among the many people left feeling desolated by Bowie’s recent death, but I understand the magnitutde of his achievements and his presence in popular culture, not just as a musician but also as a film actor. Perhaps inevitably, the two seemed to feed into one another – Bowie’s most celebrated screen appearance, playing the alien visitor Thomas Newton in the film I should really be reviewing, Nicolas Roeg’s The Man Who Fell To Earth, surely owes a lot to the Ziggy Stardust persona he had created a few years earlier. Nolan himself said that no-one else could possibly have played Bowie’s role in this film, and from a certain point of view it is easy to understand why. 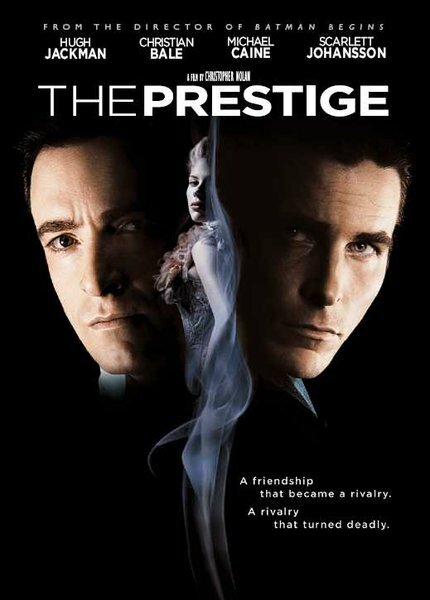 The Prestige is based on a novel by the underrated British writer Christopher Priest, and – not unusually for a Nolan production – it takes a while for its actual subject matter to become clear. The narrative is complex and oblique, with flashbacks within flashbacks, sections of apparently unreliable narration, and large quantities of smoke and mirrors. But this is only as it should be, for the film is about stage magic and its practitioners, and the differences between them and the makers of genuine wizardry. Hugh Jackman and Christian Bale play Angier and Borden, two young men at the beginnings of careers as magicians in turn-of-the-nineteenth-century London. Angier is aristocratic and a born showman, but a somewhat indifferent student of the craft – the lower-born Borden is a brilliant instinctive magician, but lacks his rival’s charisma. Tragedy strikes when Angier’s wife dies in an accident on stage, an accident Borden may have been responsible for. And thus begins a terrible feud. Tesla is, of course, played by Bowie, and – somewhat contrary to the great man’s reputation – a rather subdued and understated performance it is too. Nothing wrong with that, of course, for it’s entirely appropriate for the film. Quite how historically accurate a portrait of Tesla this is, is a good question – probably not very, if we’re honest. But Tesla’s role in the film is to be an enigma, an individual on the border between reality and myth, an irresistibly charismatic person who still is not really fully understood – and, as I say, it’s very understandable that Nolan should have wanted to secure David Bowie’s services for the role. It’s a small but crucial part, and one which is essential to the development of The Prestige‘s narrative. I believe I read a review once which cried foul with regard to this film’s final act, suggesting that by introducing, in the form of Tesla’s miraculous machine, a strong element of SF or fantasy into what had previously been a relatively ‘straight’ drama, Nolan was in some way cheating, moving the goal posts. I can kind of see where this attitude is coming from – this is a film about real-world magic, after all, carefully constructed to show the audience all the facts they need to understand what’s going on, while making equally sure they’re not aware of this until after the end of the story. Introducing an arbitrary and fantastical plot device, as the film does, arguably renders all that work moot. But on the other hand, the film seems to be entirely aware of this potential pitfall and works extremely hard to circumvent it: the revelation of the machine and just what it does is painstakingly foreshadowed from the very first second of the movie, and the facts are woven into the narrative of the film with the greatest skill. In its ability to construct a confoundingly clever puzzle-box narrative that only yields up all its secrets on the second or third viewing, The Prestige definitely anticipates Inception, although The Prestige may be even subtler and more devious. It’s certainly an ambiguous film, too: while Angier, as the film goes on, increasingly comes to resemble the villain of the piece, he is never completely unsympathetic no matter what he does. In the same way, there is always a certain distance with Borden, too – this is someone capable of some very harsh actions. Nolan, as usual, secures a first-rate cast for these roles, although the cast list in general does provide evidence for the ‘superheroes are taking over Hollywood’ argument. It’s true that Hugh Jackman doesn’t have quite the same acting clout as Christian Bale, but he still gives one of his best performances here, while Michael Caine of course provides immaculate support. The female characters, if I’m honest, feel a little thin and underserved, but this is not the fault of Johansson or Rebecca Hall. The Prestige is a film about identity and reality, and the extent to which these things are artificial and can be manipulated – several cast members play multiple versions of themselves, for instance. It suggests that people are delighted by the pretence of magic, but (rightfully) terrified by the real thing – that illusion is more often than not just a comfort. It’s a complex, dense film, full of deceptively subtle ideas, but one that couples them to a compelling story with some unforgettably shocking images and moments. For many years now, Christopher Nolan has seemed incapable of making a film which is anything less than deeply impressive, and while this is not one of his most famous or financially successful ones, it is still head and shoulders above most other movies. Bowie’s role may be small, but it is crucial to the film’s success – perhaps only something of a footnote to an acting career which was itself only a secondary enterprise, but still a very distinguished one. You might be forgiven for thinking that yet another film about robotics and AI couldn’t help but feel a bit repetitive and over-familiar, following the plethora of movies on this topic. You might be forgiven for thinking that Neill Blomkamp’s particular kind of socially-conscious, photorealistic-VFX-driven SF movie might equally be starting to lose its novelty value, given both District 9 and Elysium stuck reasonably closely to the same formula. You might even be forgiven for thinking that the only kind of genre movie coming out at this time of year would be the least ambitious and inventive kind. But I think you would be wrong, because Blomkamp’s Chappie is none of these things. The story is set in a (very) near future South Africa, where a soaring crime rate has led to the introduction of robotic police auxiliaries, designed by idealistic young scientist Deon (Dev Patel) and produced by the company of Michelle Bradley (Sigourney Weaver) – all this is rather to the chagrin of ex-military designer Vincent (Hugh Jackman), whose own heavy-duty robot drones have been somewhat sidelined as a result. However, Deon has higher aspirations than corporate profits, and is quietly working on a project to create true artificial intelligence. Bradley, needless to say, can’t see the benefit in a robot poet, or indeed any machine that can think for itself, and so Deon ends up having to install his AI in a junked chassis heading for the scrapheap. All this means that when the film touches upon deeper and more serious concerns, it’s as part of a story which already has you engrossed (if you’re anything like me, at least), rather than one which just functions as some sort of abstract and cerebral meditation on a particular theme. At one point a distraught Chappie asks Deon why he chose to create him with a body which will inevitably fail, leading to his cessation as a conscious being, and what’s previously been a sort of grimy roughneck action-comedy is suddenly considering humanity’s relationship with God and the nature of mortality, and the shift in perspective is both dizzying and exhilarating. There’s a touch of religion-bashing in the film, which is perhaps regrettably predictable, but set against this is the film’s general philosophy that it’s not your nature or your position in society that defines who you are, but the choices that you make: meeting and taking responsibility for Chappie leads to the redemption of a couple of characters who were initially unsympathetic scumbags, and this is convincingly done. The plot takes a sharp turn in the third act which perhaps strains credibility a bit, but not insuperably so. In the end Chappie isn’t just another film about AI, but one about what it means to be human, which is surely a more profound question. That it does so with some skill and subtlety within the framework of an extremely accomplished action thriller is a pretty neat trick. In many ways Blomkamp’s adroit skipping between the different strands of drama, comedy, and action recalls District 9, and for me this is a more impressive film than Elysium, even if one wonders quite how long he can keep knocking out limitations on a relatively limited stylistic and narrative theme. 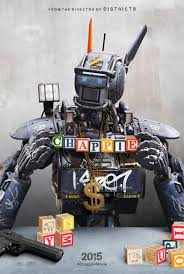 But, of course, the release publicity for Chappie has been dominated by the news that Blomkamp and Weaver look set to work again on a new instalment in the Alien franchise: something which has a large number of people very excited indeed. I don’t know. Yet more Alien sequels interest me about as much as the threatened string of annual Star Wars cash-ins, and I’d much rather directors like Neill Blomkamp were working on their own original projects. Chappie is by no means perfect, but it is still a proper SF movie with a lot going for it – I wish we had many more films like this. Seven films in fourteen years is a pretty impressive workrate, and one thing you can’t accuse the makers of the X-Men movies of is laziness. There has been an X-Men film out more often than not in recent summers, which suggests that this is a franchise with a solid audience. Not bad given the original X-Men was, by blockbuster standards, a cautiously low-budget offering (largely because the studio had taken a massive bath on Fight Club the previous year). The director of the first two X-movies, Bryan Singer, returns for the latest instalment, the evocatively-titled X-Men: Days of Future Past (well, evocatively-titled if you’re familiar with the classic storylines from the comic series). If you’ve ever seen and enjoyed an X-Men film in the past, then there’s a very good chance you’ll enjoy this one – not least because it’s bound to have your favourite character in it somewhere. 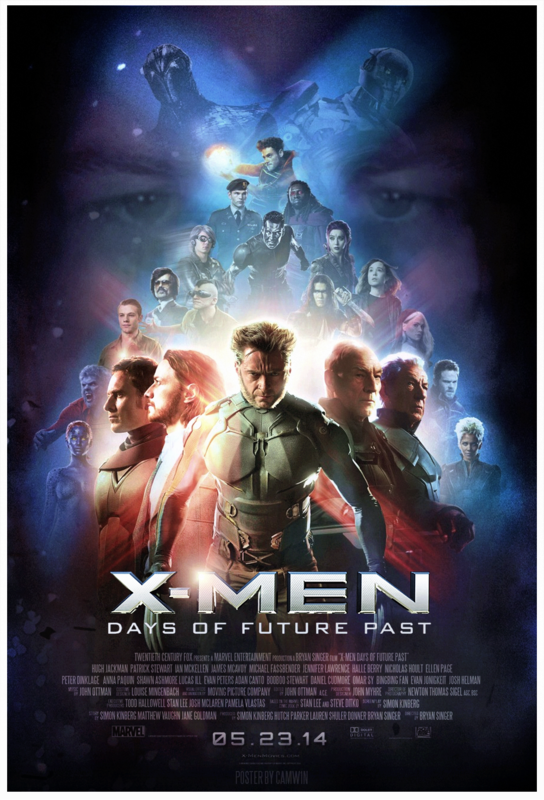 Days of Future Past opens in a nightmarish near-future – two parts Terminator to one part Matrix – with the remnants of humanity and mutantkind oppressed by robotic enforcers called Sentinels. The last few outposts of resistance are gradually being crushed, despite the best efforts of the defenders. The war has been lost, and all hope with it. Well, perhaps not quite. A faint glimmer remains, as Professor X (Patrick Stewart) has a cunning plan to prevent the whole crisis from happening in the first place. He intends to project the consciousness of Wolverine (Hugh Jackman) back through time to the early 70s. 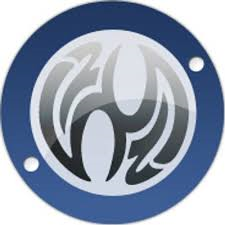 The Sentinels began as a US government mutant control project, and if the project can be shut down at an early enough stage the future can be saved. First things first. Post-credit scene? Yes. (It seems to gradually be becoming the norm for all the Marvel comics movies, not just the Marvel Studios ones.) This one sets up X-Men: Apocalypse, due in 2016, but how much you are stirred by it will depend on your familiarity with the comics in the late 80s and after. The first purpose of any X-Men film is, obviously, to make truckfuls of money for 20th Century Fox, and I suspect this one will do so. Beyond this, one of the main things Singer seems to be looking to do is stitch together the disparate elements of the X-Men franchise – hence, actors from what I suppose we can call the original trilogy (Stewart, Jackman, Ian McKellen, Halle Berry, Shawn Ashmore) appear alongside the ones who appeared – sometimes in the same roles – in First Class (McAvoy, Fassbender, Lawrence, Nicholas Hoult). If you’re really obsessive about the detail, the film doesn’t quite manage to square this particular circle: the major beats of continuity are okay, but there are just too many little details that don’t match up, too many inexplicable resurrections and duplications of characters. Nevertheless, the time-travel storyline is very engaging (one shouldn’t criticise it for ripping off The Terminator too much, given the original comic came out in 1981) and allows the movie to include the best elements from all the previous films. The results are supremely entertaining. I’ve always been ever-so-slightly lukewarm about most of the X-Men films in past, particularly the two Singer directed, not liking them as much as I wanted to and always feeling that Singer was actively shying away from the more colourful comic book elements of the stories. But this time he really gets it right, drawing on specific comic-book plotlines to conjure up a story that’s about as comic-booky as you can get (superheroes, time-travel, giant robots) with seemingly no reservations at all. Of the returning stars, it’s again Michael Fassbender who really dominates the film as the younger Magneto – he manages to put Ian McKellen in the shade, which is no mean feat – and there’s something very exciting about seeing him square off against Hugh Jackman as Wolverine, as happens at a couple of points. The film’s big innovation, character-wise, is Quicksilver, played here by Evan Peters. The level of wit and invention in his sequences raises the bar for how this kind of character should be presented, and with another version of Quicksilver due to appear in Avengers: Age of Ultron (basically, for obscure reasons he is covered by both the X-Men and Avengers rights licences), it will be interesting to see how Marvel Studios respond. Days of Future Past may not succeed in unifying the X-Men continuity, but that’s a moot point, not least because said continuity is substantially rewritten in the course of the film anyway (the joys of time travel plotting). In every other respect, though, this is a film which succeeds magnificently – it’s thrilling, funny, witty, and occasionally moving, with great performances and visuals. Not only is this the best blockbuster of the year so far, but – and I should probably stop saying this – it’s the best X-Men film yet, as well. With a concerted effort I have managed to break the Curse of the Vue, which means that this week’s New Cinema Review will cover somewhere totally and utterly new and surprising. Or, to put it another way, another cinema in the same chain as the one I routinely patronise for nine months of the year anyway, for it is another Picturehouse. Yes, this week I trekked all the way south to the Brixton Ritzy (possibly the highest-scoring movie house in London when it comes to Cinema Scrabble), but the journey was certainly worth it, for this is a lovely place to go and watch films: not only is the biggest auditorium genuinely beautiful to look upon, but the smaller screens aren’t bad either. Best of all, it has its own bar and restaurant for occupying those moments between screenings – all they need is a place to sleep and I can move in. The plumbing facilities are a bit cramped at peak moments but I suppose you can’t have everything. Suffice to say this place is mounting a strong challenge for the title of Best Cinema in Britain. Onto the first film I watched there: Marvel Comics’ answer to Yosemite Sam makes a proper return to the big screen in The Wolverine. This marks a bit of a moment in superhero movie history, as Hugh Jackman definitely pushes past Christopher Reeve’s record to become the first actor to play the same superhero as a main character in five major movies (to say nothing of his F-bomb-tastic cameo in X-Men: First Class). The last solo Wolverine movie, 2009’s Origins, is not really a well-loved film, but it clearly did enough at the box office to prompt a follow-up. Possibly the most surprising thing about this film is that for a while it was slated to be directed by Darren Aronofsky of Black Swan renown: but he moved on and the actual director is James Mangold. As the movie opens, our skeletally-souped-up hero is not in the best of states: beset by guilt over the death of the woman he loved (not to mention over a century of frenzied and largely indiscriminate gutting and maiming), Logan (Jackman) is living as a hermit in the Canadian wilderness. He is drawn back to civilisation by the appearance of Yukio (Rila Fukushima), the young ward of Yashida, a man Logan saved from the bombing of Nagasaki in 1945. Now Yashida is dying and wants to do Logan a great favour before he dies. The X-Men movies have been running for 13 years now, which is quite long enough for their internal continuity to have become as tangled as those of the original comics: nevertheless, it was still a little bit startling to be presented with a film set firmly in the same continuity as the original trilogy (as opposed to the most recent film, which – if you’re paying attention – is about a different version of the same characters. Some sort of doubtless-unsatisfactory attempt at a unification bout between the two looms for next summer and is unsubtly trailed at the end of this movie). On the other hand, I had sort of forgotten how much I liked Hugh Jackman as Wolverine, and how much undemanding fun those first few films were. So more of the same wouldn’t necessarily have been a problem. However, and quite excitingly, this film is clearly at least partly inspired by Claremont and Miller’s Wolverine mini-series from the 80s, which had the same Japanese setting and imagery and some of the same characters. That series was acclaimed, partly for simply being very well scripted and drawn, but also for doing something different with Wolverine as a character. This is where the problems with The Wolverine really start to come into focus, unfortunately. When superhero characters start acquiring definite articles they don’t usually have, it’s usually a sign that an inherently absurd character is being taken very seriously indeed, either by creative types or fans (note the legions routinely referring to The Batman rather than just Batman). I’m not sure what difference this really makes, but there you go. On one level The Wolverine obviously wants to have a bit of heft and gravitas to it – it pulls a trick very similar to the original X-Men, which opened with a scene set in Auschwitz. This film starts with a triple-seppuku and the atom-bombing of Nagasaki (still an incredibly touchy subject in Japan, by the way: curious to see how this plays there), and if something as serious as that’s your big opening you’d better be damn sure you’ve got something solid and thought-through coming up to justify it. The Wolverine‘s problem is that it really can’t decide exactly what it wants to be – another competent, if by-the-numbers superhero movie? A japonesque action flick? A moody character piece? At various points it has a go at all three, but never really fully commits itself and so isn’t entirely successful at any of them. And whatever qualities it has, dramatic heft and thematic gravitas are not amongst them. Despite the putative complexity of the story, the plot basically boils down to Wolverine and Yashida’s granddaughter Mariko (Tao Okamoto) on the run from bad guys, from whom they escape via a series of competently orchestrated action sequences. Given the number of definitively Japanese settings in which this occurs, it looks ominously like cliche-tourism is in progress: we get Wolverine at Tokyo Tower, in a pachinko parlour, on a shinkansen (a preposterous fight occurs on the roof), and in a love hotel. Presumably the sequence set in a karaoke club will be a DVD extra. However, then the film calms down a bit and we get some proper mood-and-character-based stuff about Logan and Mariko and the relationship that develops between them. There’s a slight problem here in that Mariko always comes across as a slightly drab and passive character compared to Yukio, but Okamoto and Jackman are good enough – just – to make you care about and believe in the romance. Let’s be straight about this: Hugh Jackman’s charisma and presence go a long way towards making any movie he does watchable, and cameo appearances from a few other big-name X-Men stars don’t hurt the film either. Unlike Origins, The Wolverine doesn’t just feel like a succession of comics references and set-piece fights. And it’s never offensively dull or stupid (although one is inclined to sigh when jokes from 40-plus-year-old Bond films get recycled) – but it never really dazzles, not with the intelligence of its script, the strength of its performances, or the dynamism of its action sequences. It’s quite rare for Hollywood to do an action movie this firmly rooted in Japan, let alone a superhero movie: The Wolverine could have been something really unique and memorable. But it feels like every time a key creative decision needed to be taken, keeping the mainstream superhero-movie audience happy and unchallenged was the one and only consideration. For a project attempting to fuse American superheroics with Japanese culture old and new to turn out to just be an okay, vaguely sort of fun, vaguely sort of exotic, just generally sort of vague fantasy action film must count as a bit of a fumbled ball. Zannen desu.